Solid colors. Solid colors let you and your family be the focus without visual distraction and clutter. Color theme. Choose a theme to coordinate your color. For example you might choose “earth tones”, pastels, or blues and greens. Your group doesn’t need to be wearing the same color but the clothes should all look good when spread out together on a bed! Textures. Textures can add subtle depth and accent in a portrait. I adore textures! Climate Check. Make sure your family or group looks like they are all in the same climate. I remember taking my own family photo one year when my daughter wore shorts and flip flops while my niece wore a jeans, Uggs and a sweater. 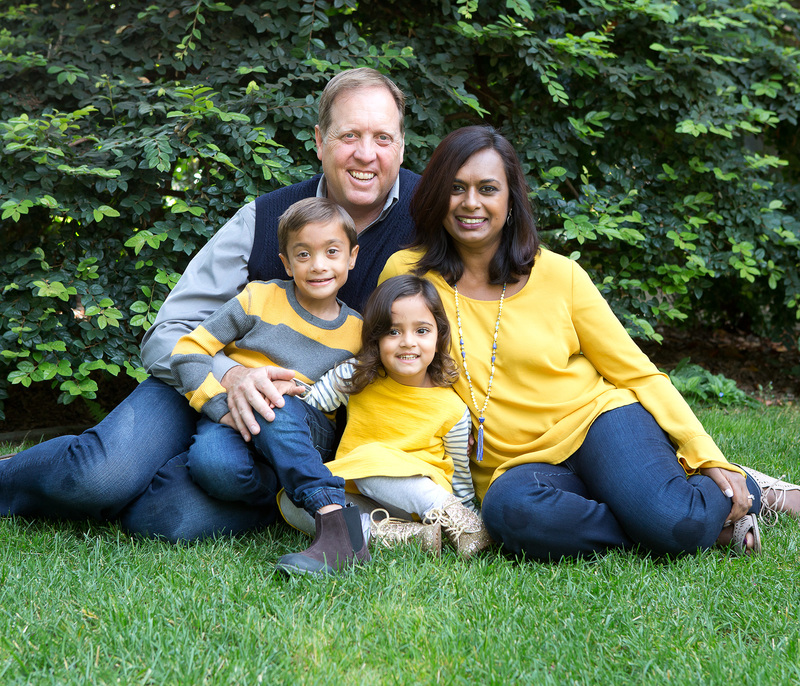 While I do appreciate their individual styles, I was shooting for a more homogeneous look for this family portrait. Gotta love it. If you or your kids don’t feel good in your clothes it will show in your pictures. Solid white and neon. Avoid solid white and neon. Your eye is naturally drawn to the lightest part of a photo so if only one person wearing a white shirt that person REALLY stands out. Same hold for neon. Anything too trendy. If you are on the cutting edge of fashion then it might not be that long before you look back at your photo and think “what was I thinking!” When in doubt, go a for a classic timeless look. Wrinkles. Check your clothes for wrinkles. These are difficult to correct in photoshop. Not a Rule Follower? Throw caution to the wind and break all the rules. If that suits you and your family – then I say GO FOR IT! If you all have different styles or love lots of wild patterns or have your own unique vision, I’m all in! My goal is to deliver images that captures your family in a way that you will love for years to come. This family pictured above always has terrific outfit choices for their photography sessions. Their clothing colors are coordinated but not forced. Notice how terrific that texture in the sweaters look in their portrait. Also, that scarf is the perfect accessory to bring the color theme together and harmonize the group. 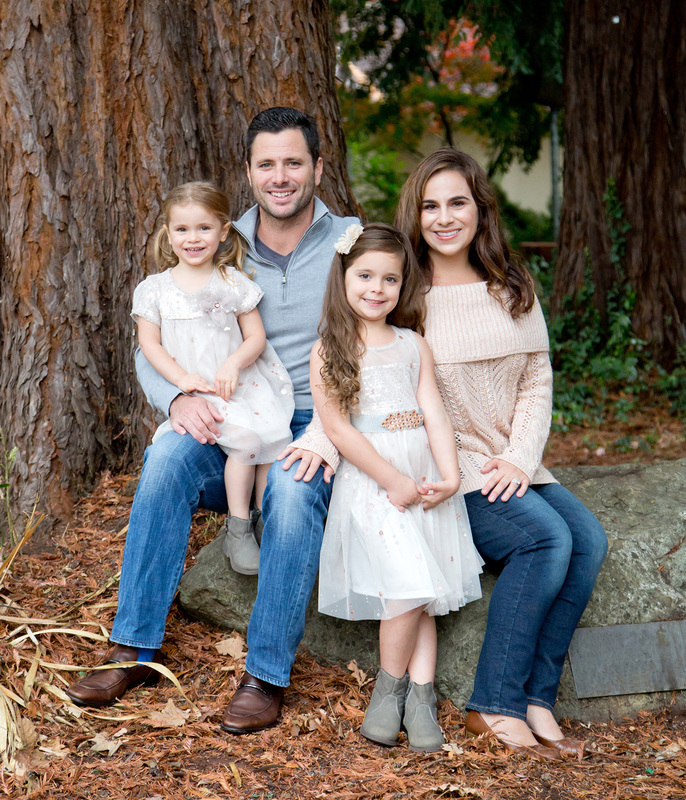 This photograph was taken at a family session in San Francisco at Baker Beach. 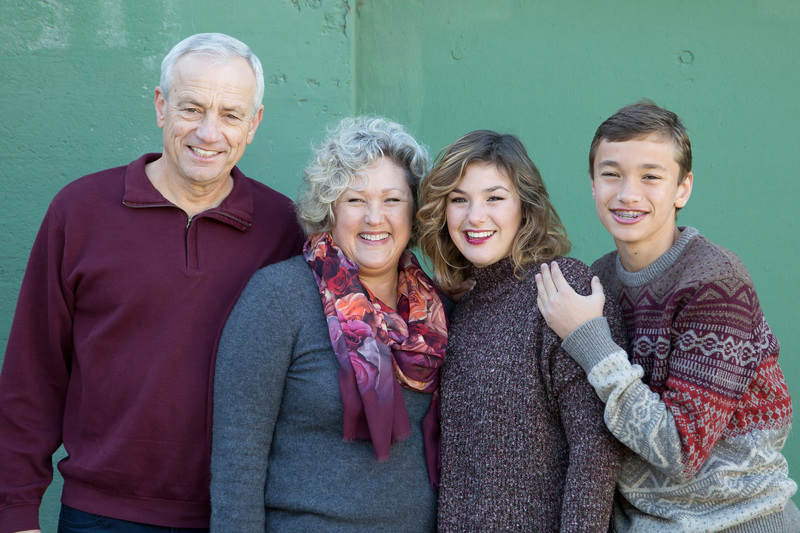 This family chose to wear lovely light cream tones for the photography session. Mom’s peach sweater relates to the peach accents on the girls’ lovely dresses. And check out the boots on the girls. Not only are they brimming with personality but their grey color ties to their dad’s grey sweater. What a lovely family! This photograph was taken during their session at Twin Pines Park in Belmont. 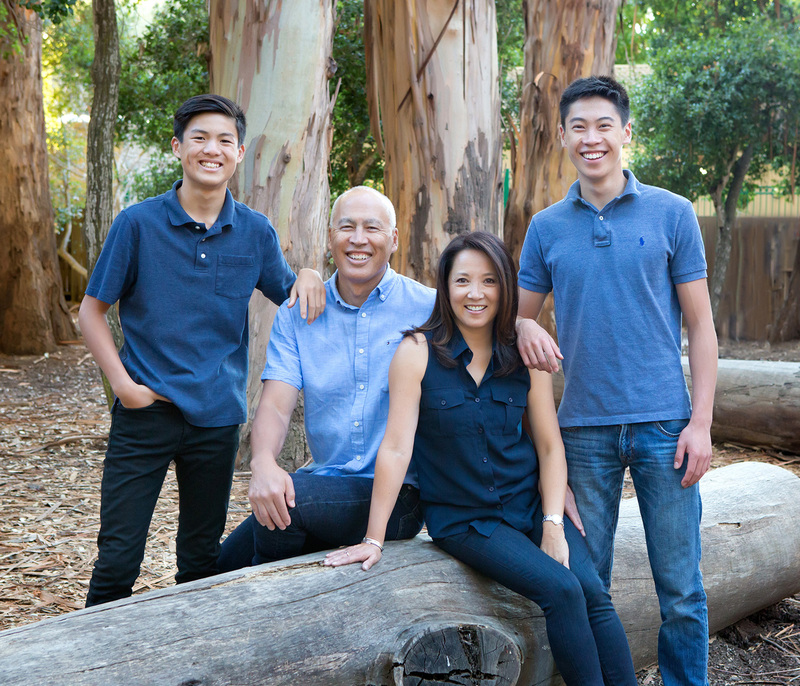 When this wonderful family met me at Elizabeth Gamble Gardens in Palo Alto for their family photography session I was delighted to see that they had thought outside the box with their color choice. I loved the mustard yellow theme color they had selected and knew it would look good through my camera. Notice that the boy’s striped sweater is the perfect bridge to dad’s grey sweater. Let’s not overlook the way the girl’s stripped sleeves work with both her brother’s stripes and dad’s grey sweater. And how about those sparkle boots!!! This young girls was simply beaming with pride in those boots and it put her in the mood to be photographed. It’s wonderful to photograph kids who adore what they are wearing. It really does show! When in doubt go with Blue! When I photograph large families, blue is generally the color that is easiest for people to find and coordinate. Plus blue looks reliably great in all settings! Who doesn’t love blue? An added bonus for your family photography session is that if you are already planning on wearing blue jeans then your colors will naturalize harmonize with your jeans. I photographed this family at Twin Pines Park in Belmont. Break the Rules! I normally advise against mixing lots of blacks with white but in this family session it really works. The mom’s shirt is cream rather than a stark bright white. 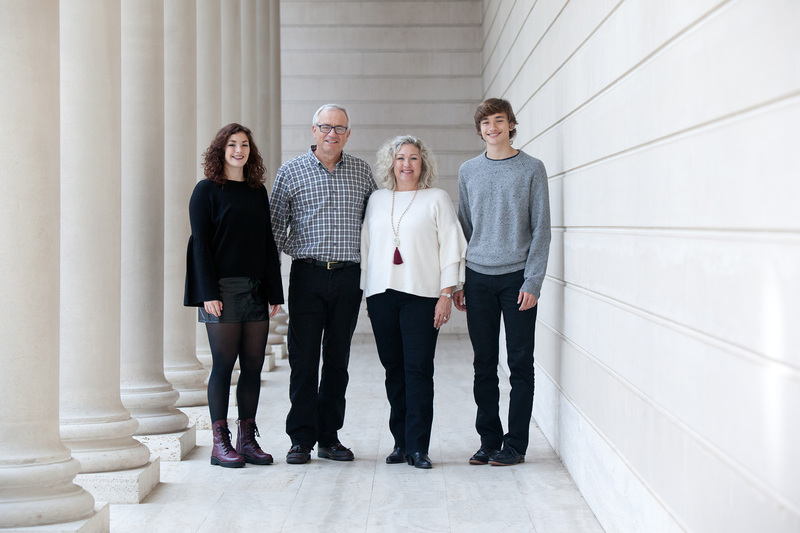 The lovely cream color and texture of the classic building at the Legion of Honor in San Francisco really allows this family and their outfits to pop. When choosing outfits do think about the location of your setting and how your outfits will work with it. Interested in scheduling a session or getting more information? Call me at 650 631 8284. I would love to design a session with you and create images you will adore! Bay Area Engagement Session! Congrats to this couple!